Editor's Note: In our Behind the Scenes series, CNN correspondents and producers share their experiences covering news. NEW ORLEANS, Louisiana (CNN) -- New Orleans Reserve Police Officer James Hearty and I are walking through New Orleans' 9th Ward, and he's trying to explain what happened to his city in the aftermath of Hurricane Katrina. Few people can fathom how the city came apart in the floodwaters, how the police and other authorities struggled to bring order back in the midst of an apocalypse. "My wife and daughter don't want to know anything about what went on, and I think the reason is they don't want to believe," he says. "Well, I think they believe it, but they don't want to hear about it. Some people don't want to believe something like this could happen in a major city in the United States -- that it could come to this." "And what did it come to?" I ask, hoping to capture a sound bite that sums it all up. "Kate, you know," he says. But I don't know, and it's frustrating. On September 11, there was no gray areas. There were heroes and villains and innocent civilians. It happened on one day in one place, with cameras and voicemail recording it all. In New Orleans, the water drowned all the evidence, the lights went out, and nobody -- not even heroes like Hearty, who rode into town to save people -- got out with a clean conscience. "You know what the marks mean on the house, Kate? Possible body," he says. "I hate to say it, but you can smell 'em. They probably came by and smelled it, but there was so much debris and they couldn't enter, so they put on possible body." We walk past workers who are cutting up a barge -- the officers call it "Noah's Ark" -- that broke through the levee and is parked on a city block. The same rush of water caused a five-house pile-up nearby. "Now it's been six months, and it's still like this. It's amazing," he says. The first time I met Hearty -- two weeks after Hurricane Katrina -- he wore combat boots and carried a machine gun. His mustache was black, and he was quiet. I was intimidated. But on this day, the day after Mardi Gras, Hearty wears civilian clothes. He's just one of hundreds of thousands of people who lost everything last August. He says before the storm his life was in great shape. He was going to work until August of this year at a sugar refinery, retire and join the New Orleans Police Department full time. The house was almost paid off. "And then in one day's time it was gone," he says, "Everything." Now, he can joke about his situation. "It's not too bad, 'cause I live in a trailer down by the river, and I'm happy with it," he says, referring to his FEMA-supplied temporary home. As I ride around with Hearty, I begin to get some perspective. He points to a school. "This is where some of them were holed up. They had some good people in there, but the criminal element, you know, was in the school." Federal law enforcement agents and some officers from Texas "went in and cleaned them out," Hearty says. "At least that's what my friend in the Fifth [District] told me, 'cause I asked him exactly what happened there." It is another secondhand story about violence after the storm -- violence that was either overblown by the media or under-reported by law enforcement. I was starting to become more obsessed with setting that record straight: How badly did things fall apart after Katrina? "And we had wondered why other districts had pulled back, but the First District stayed," he says. His unit was a buffer zone between two projects, he says. Hearty and a small group of other officers calling themselves "River Rats" -- without any guidance from their commanders -- went out to look for boats and tried to rescue people. On the fourth night, they came across a balcony full of children who wanted to be evacuated. "It was actually in the project area, which is dangerous in and of itself, and to take and lower these children into the boat was dangerous," he says. They had to go back to get a second boat so they could get all the children out at the same time. A captain saw the men and said there had just been a shooting in one of the projects. "And he says, 'It won't do any good for you to go back because if you get shot, they'll have the boat and the children won't get saved.' "
So a frustrated Hearty went back to the station and eventually fell asleep with his guilt in his Isuzu Trooper. On the fifth day, help arrived from outsiders. Hearty is still angry at the federal government for its slow response, but he's harder on himself. While he was rescuing people in New Orleans, his dad had to be rescued by his nephew. "I didn't know if he was dead or alive," he says. All of the choices, the ambiguous situations, the thin line between hero and coward have taken a toll on Hearty. As he sits in front of his trailer in St. Bernard's Parish, he looks at me and says, "Don't ask me how morale is." So Katrina's burden is now on me and I have to make choices about whose story gets in the documentary and whose gets cut, whose pain and which injustice gets air time. We have a less than an hour. Hearty's story of conflicted heroism gets cut from the documentary for time. I, too, have to wonder if I left the wrong person behind. 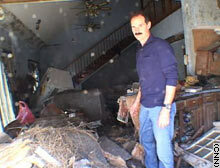 James Hearty stands in his St. Bernard's Parish home, six months after Hurricane Katrina hit New Orleans.